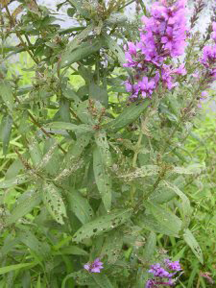 Damage to Purple Loosestrife due to feeding by the galerucella beetle. Both are invasive species in North America. In their native habitat, the beetle controls the loosestrife, but in North America, where the plant is uncontrolled by native species, the beetle has been imported to prevent the plant from dominating wetlands. The pictured plant is at Fresh Pond Reservation, in Cambridge, Massachusetts. Invasive species are in many ways the natural analog of the lateral micromanager. They move into an environment that isn't their own, and quickly dominate unless some element of the invaded domain responds with an effective defense, or unless a new element that can provide an effective defense enters that domain. In work groups and teams, it is the responsibility of management to notice lateral micromanagement (which is, after all, a performance issue) and intervene — that is, to play the role of the galerucella beetle, or to recruit someone who can serve that function. Failing that, someone, or several someones, must step forward to effectively inhibit the behavior of the lateral micromanager. Unless some action is taken to limit the behavior of the invasive species (the lateral micromanager), nothing can prevent it from choking the ecosystem (the team). Photo by E. Wylde, courtesy Cambridge Water Department. Lateral micromanagement happens most often in everyday interactions or in collaborations between peers, when one co-worker tries to direct others, or exerts undue authoritative influence over them. It's much more than "bossiness" — it usually relates to the career ambitions of the lateral micromanager. Because ambition is usually involved, lateral micromanagement is often coupled with attempts at image management. The lateral micromanager strives to make clear to higher authority that success of the joint effort is largely due to his or her own personal contributions and leadership, and inversely, failure is due to the poor performance of others. As with most micromanagement, the nature of the directing behavior focuses not on results but on factors more immediately related to the lateral micromanager's ambitions and self-perception. Here are three of those factors. Lateral micromanagers try to specify techniques, even when the work being done is outside their areas of responsibility. Excuses might include remote but plausible risks, or whether the method is consistent with established procedures, or personal ethical concerns. Often the true goal is to require the use of methods for which the lateral micromanager can claim credit. By asserting priorities or the need for tight deadlines or tight budgets, often beyond any constraints imposed externally, lateral micromanagers hope to limit choices. Sometimes the constraints rule out approaches competitive with those they advocate. Those constraints can also influence priorities in the micromanager's own favor. Lateral micromanagers sometimes advocate the use of particular resources — human or otherwise — over which they have control or responsibility. This gives them leverage. Since ambition is the focus, the group's results are not central to the lateral micromanager's goals, which are establishing and consolidating personal power, and creating or burnishing an image of power. Here are some suggestions for dealing with lateral micromanagers. The younger, rapidly rising stars are sometimes skilled not at the work, but at the rising. Lateral micromanagers rise not so much on their achievements or leadership as on their ability to project an image of achievement and leadership. Have them commit publicly to deliver results personally. For example, you could propose, "I'll cover X if you'll cover Y." If you can keep them occupied delivering on personal commitments, they have less time for lateral micromanagement. Be clever; they will resist. Once a lateral micromanager discovers that you understand the strategy, you might be targeted for isolation. Prepare in advance: alert your allies to your intentions, and let them know that the lateral micromanager might try to come between you. Ask for their help. For more about micromanagement, see "When Your Boss Is a Micromanager," Point Lookout for December 5, 2001; "There Are No Micromanagers," Point Lookout for January 7, 2004; "Are You Micromanaging Yourself?," Point Lookout for November 24, 2004; "How to Tell If You Work for a Nanomanager," Point Lookout for March 7, 2007; and "Reverse Micromanagement," Point Lookout for July 18, 2007. Would you like to see your comments posted here? rbrenajqLxvtCRpKbXTdUner@ChacKyCvNhWyiZdUFBzyoCanyon.comSend me your comments by email, or by Web form. I offer email and telephone coaching at both corporate and individual rates. Contact Rick for details at rbrenBScPJpqnYakffxJbner@ChacKbiRaQpTnMTfCQIkoCanyon.com or (650) 787-6475, or toll-free in the continental US at (866) 378-5470.